Spin Transfer-Torque Magnetic RAM (STT-MRAM) is a future DRAM replacement candidate. It uses one of two different spin directions of electrons to signal a binary one or zero. IBM and Samsung scientists have published an IEEE paper* demonstrating switching MRAM cells for 655 devices with diameters ranging from 50 down to 11 nanometers in just 10 nanoseconds using only 7.5 microamperes. They say it is a significant achievement towards the development of Spin Torque MRAM. 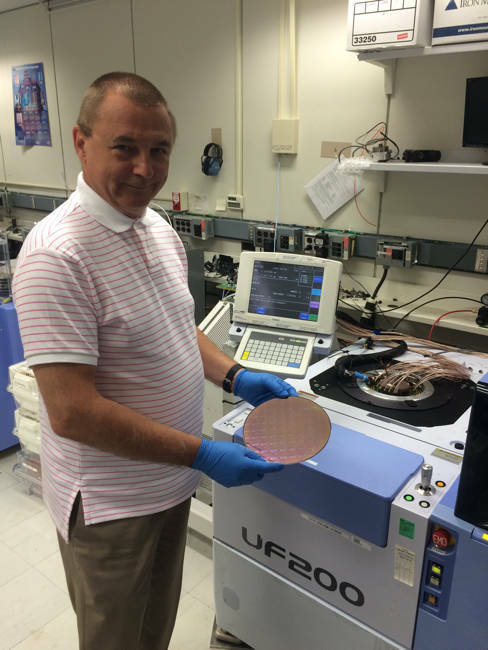 IBM scientist Janusz Nowak holds an STT-MRAM wafer. * The IEEE paper is entitled "Voltage and size dependence on write-error-rates in STT MRAM down to 11 nm junction size."